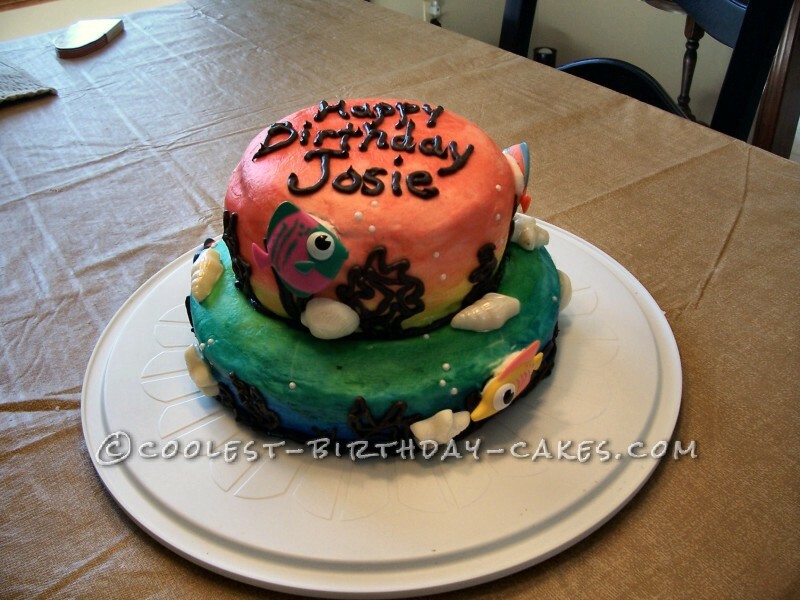 It is my daughter’s 7th birthday today and she is used to my past attempts at elaborate birthday cakes. Sure, I want to make my daughter feel special on her special day, but I also have an ulterior narcissistic desire to showcase my artistic abilities. 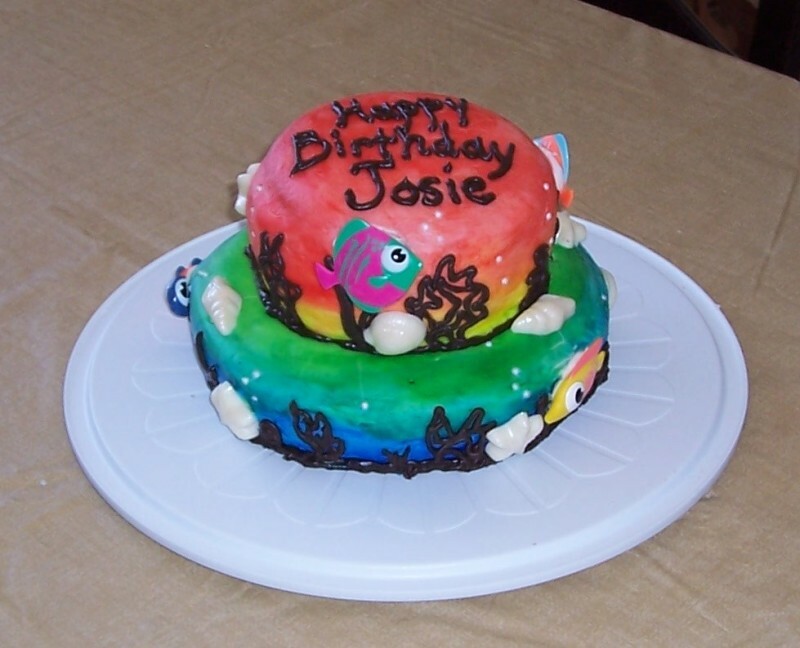 So a few weeks ago I asked her what kind of cake she wanted for her birthday and her exact words were, “ I want a cake that is decorated with rainbow frosting and plastic fish.” I am not sure why she was so specific, but she was confident I would deliver. When I set to work, I knew I wanted a gradient rainbow in order to look like a sunset reflecting in water (I think any other rainbow pattern could have easily been mistaken for clown vomit). However, I also knew I didn’t want to bother with mixing 7 different colors of frosting and trying to blend them and gauge how much I would need of each one on the cake. So I tried a new technique to get the rainbow by painting food color on white butter cream frosting. I piped some underwater silhouettes using chocolate frosting. I had to do a little searching but I did find plastic fish. Thank goodness retailers are starting to shelve the pool toys! I finished the decorations with white chocolate seashells and edible pearls. 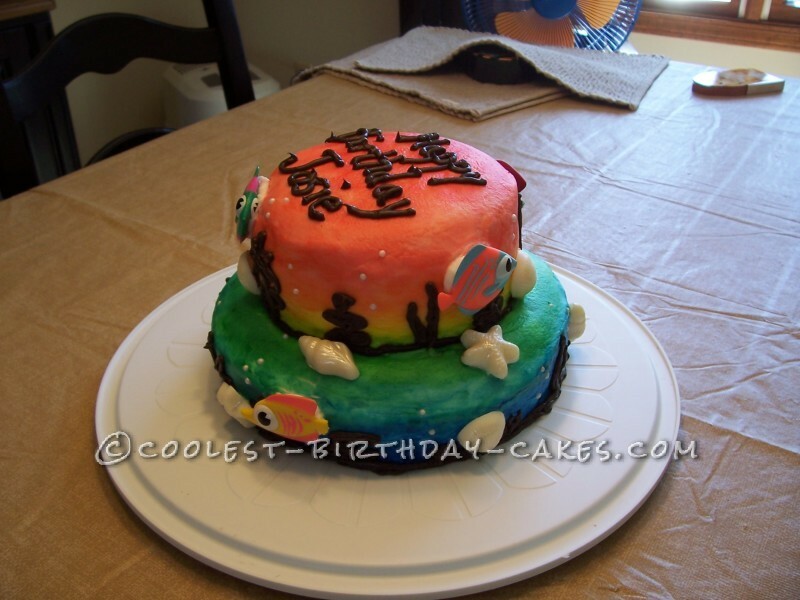 I usually try to avoid inedible decorations on cakes. Somehow it just feels wrong and I always yell at the Cake Boss when he does it. However, I have a new born baby at home this year and something had to give. I think the final cake turned out really great and I think my daughter really appreciated it a lot. She even enjoyed the pool toys in her bath later. This project also satisfied my annual urge to express my creativity through frosting. I hope you like it!